Stratford, Ontario is a city that invites the imagination to thrive. Many wonderful artists call Stratford home. Not only the theatrical and musical arts flourish here, but visual arts of all types abound. On my walk home today I saw one of my neighbours out creating a new garden. I stopped to chat and she invited me in to see her finished sculpture. It stands 8 feet tall and is a 3D portrait of Norval Morrisseau, an Ojibway artist and Shaman who is considered by many to be one of Canada's most original and important artists. When he was 19, Norval Morrisseau recovered from a severe illness after a mystic ceremony performed by a medicine woman, where he was given the name Copper Thunderbird. In the late 1950's he became sick again with tuberculosis and met his wife Harriet Kakegamic in a sanitorium in Thunder Bay. She taught him to sign his artwork as Copper Thunderbird in Cree syllabics. My artist neighbour, Susan Murar, has captured the dichotomy of the face of the thunder bird interwoven with that of the artist. I was captivated by the sculpture's eyes and the intricate details that pull images from his artwork. Back and front, both sculptures in the set display a wonderful array of Ojibway legends. If you are ever passing through Stratford do take the time to look up artist Susan Murar. She is a fascinating and talented woman. The statue, by the way, is created from white plasticine - still awaiting its final bronze cast. NOTES: Susan Murar - former owner of the Stratford Brass Rubbing Museum and Gallery - stated that she had always admired Norval Morrisseau’s work and that he had really influenced her as an artist. After Norval Morrisseau died in December 2007 she knew she found the perfect subject for a large-scale portrait sculpture she had been looking for a long time. That started a two year journey which included plenty of research into Norval Morrisseau’s body of work. "Norval Morrisseau created art that will be around for centuries to come and that’s how she wanted to portray him as the artist, not taking into consideration the smallness we all have in our lives and added that everyone has a core of hope and promise, and it’s connected to your heart and your spirit being. If you know that about yourself you can go over a bridge and find it in somebody else." She designed the sculpture so that when a parent holds a child in their arms for a closer look, the child is eye-to-eye with Norval Morrisseau. 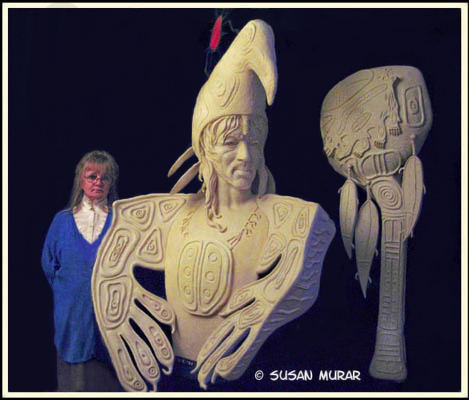 The arrangements for this portrait of Norval Morrisseau had been made to be showcased at the 2010 Winter Olympics in Vancouver, but unfortunately Susan Murar was not able to complete the sculpture in time.